Ideal for use in a range of industrial environments, mesh enclosures and partitioning provide a strong and durable solution for warehouse storage and safety needs. Stodec Products stock the highest quality Caelum mesh partitioning, giving a flexible system that is available in a wide variety of widths and lengths. With a powder coated or galvanised finish, hinged or sliding doors and a selection of locking arrangements, mesh panels are perfectly suited to a number of applications, from temporary partitions to room dividers. 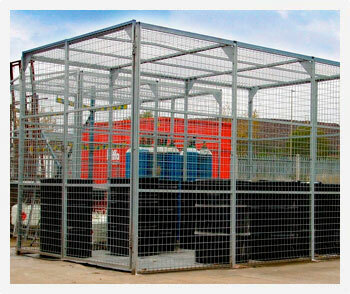 We also provide free-standing mesh security enclosures for maximum protection and safety for valuable items or equipment. For more information, or to request a site survey to determine your needs, get in touch with Stodec Products today. We have provided high quality mesh partitions for security, data centre enclosures, external storage, quarantine areas, chemical & gas storage compounds. Our separate brochure on machine enclosures shows how security as well as health & safety issues are dealt with using specialised locking systems.